2016 was a transformative year for Twitter, with no shortage of interesting moments that broke and took shape there. We saw brands evolve their use of the platform. Many moved away from using Twitter primarily as an engagement channel, to embracing our video offering as the centerpiece of big brand campaigns, with clever engagement pieces laid on top. This has helped drive the 220x growth in video views that we’ve seen, as video becomes the lead vehicle for brands and publishers alike to connect with their audiences. Within video, there have been some interesting trends to take shape in 2016 – including further partnerships with content creators through Twitter’s Niche offering, greater innovation with live video through Periscope, and premium video sponsorship initiatives through Twitter Amplify. Beyond video, we continue to be blown away by the ways our partners are making use of creative tools on Twitter. To illustrate these trends, we’ve taken a look at ten of the biggest campaigns of the year, as determined by the volume of Tweets mentioning the main campaign hashtag. This isn’t an exhaustive method, but a good indication of the types of campaigns that got people talking last year. We hope this recap inspires your thinking for 2017. The gaming community is massive on Twitter – and happens to be a hugely passionate audience, willing to get involved in creative campaigns. Xbox gets this and absolutely smashed it with last year’s launch of #GearsOfWar4, sparking over 700K mentions of the hashtag. To spark usage of the hashtag and create excitement pre-launch, Xbox partnered with Twitter on a custom emoji that would fire in conjunction with #GearsOfWar4. It launched using Twitter’s First View product, making the game trailer the first piece of content that people across the UK would see when they opened up Twitter over a 24 hour period. Xbox also used Periscope in two interesting ways – first to put the game in people’s hands by streaming a high quality version of the prologue. And secondly Xbox broadcast from a top secret location where grime rapper (and Gears of War fan) @JmeBBK was waiting to play the new game and give away prizes to the first person to show up. To continue building momentum, Xbox created a four-pack of Twitter Stickers to enable fans to decorate their photos with iconography from the game. It pulled together the best of these in a Twitter moment. Finally, Xbox gave gamers the opportunity to #PartnerUp with like-minded gamers to play co-op Gears of War for a chance to win cool prizes. When John Lewis revealed this year’s Christmas ad, #BusterTheBoxer – offering us all some much needed levity in a tough year – a collective sigh of relief echoed across Twitter. After a series of unbranded teasers, John Lewis used our native video product to promote the ad on Twitter, ensuring it was seen by as many people as possible in those critical first days. The ad picked up an incredible 30,000 Tweets in just over two hours after going live. Once the story of Buster was out there, the focus of the campaign shifted to playful personalization, which delighted core fans. Through Twitter Stickers, people were able to add the woodland creatures to their photos. The John Lewis team even invited users to send in a photo to get back a personalised video, featuring the playful creatures. Every year, Coca-Cola delights the nation with #HolidaysAreComing, its iconic ad featuring the festive Coke truck that first debuted 21 years ago. To settle the annual debate as to when the ad will make its UK debut, fans could simply Retweet this and they’d get notified the moment it was going to air. What’s more, this year a virtual truck took over Twitter through a custom emoji. Every time someone Tweeted the campaign hashtag, a visual of the truck would appear, as if by magic. Coke also announced its truck tour on Twitter, inviting people around the country to join them at each local event. 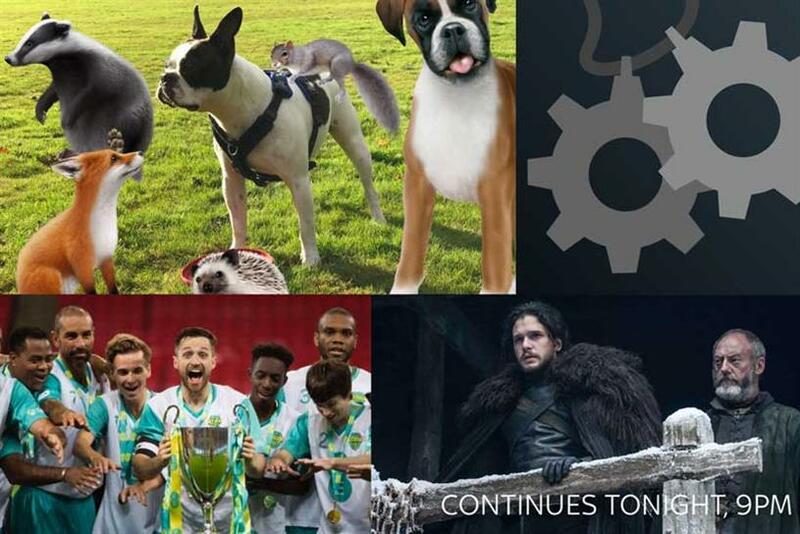 Ahead of one of the most anticipated TV moments in 2016, season six of Game of Thrones, Sky partnered with Twitter to drive conversation around the show. Through our simple "Retweet to remind" feature, Sky invited fans of the series to Retweet their announcement and request a reminder to tune in every week. Not only was this hugely useful, but it also gave Sky a reason to engage directly with every single GOT fan, all series long. They used different images and copy each week, sparking curiosity and anticipation hours before airing. Fans loved the reminders, often thanking Sky and sharing it onwards. It’s a great example of how to be useful and leverage some of the unique tools that Twitter has to offer. This time last year, we had only launched Niche (our content offering) in the UK. One year in, and we’ve had the privilege of partnering with many brands on innovative content campaigns, with #BlairWitch being a particular highlight. Using Twitter and Periscope, the three creators produced such high quality (and terrifying) content that many people mistook it for being an additional trailer to the film! It generated a ton of interest and conversation around opening weekend, which was exactly what Lionsgate was looking to do. The live nature of Periscope was especially powerful here in making the stunt feel authentic and real, which again added to the mystery and debate around the content. After the huge success of #WembleyCup last year, @EE returned this year making it bigger and better – growing the conversation by over 47% year on year. The proposition is simple: two teams, led by the top social talent in the football world, Spencer Owen and Joe Weller. The two battle it out across a series of challenges, leading up to one big final at Wembley. As a sponsor of Euro 2016, Budweiser wanted to ensure it was front and centre on Twitter throughout the tournament. To do this, Budweiser partnered with Twitter and #EURO2016 broadcaster, @ITVSport, to deliver real-time highlights into fans’ timelines through Twitter's Amplify offering. During ITV matches, the best clips were extended onto Twitter and promoted by Budweiser to its audience, with a relevant pre-roll. To further cement its place at the heart of the conversation, Budweiser commissioned a custom emoji, #ThisBudsForYou, and joined in with fans to celebrate the wins – even offering every single fan in Wales a free Bud to celebrate the team’s unexpected success. With #Rio2016 around the corner, Virgin Media launched a powerful campaign last summer to cement its place in the ensuing Olympics conversation. Starring @UsainBolt, the campaign was designed to show people what 9.58 seconds feels like, which is the amount of time it took Bolt to break the 100m world record in 2009. The hero video featured a collection of 9.58 vignettes, showcasing various aspects of Bolt’s life. There are a lot of things to admire about this campaign: from all the ways in which it brought to life Bolt’s record, to the hashtag #BeTheFastest which worked on many levels, not only summarising the campaign but also celebrating its ambassador and pointing to a key product message in a subtle and natural way. To give the hashtag a proper launch, Virgin Media partnered with Twitter to create an iconic custom emoji that went live when the clock struck 9.58pm the night before the campaign launch. The brand also celebrated it and the ad on a 100m barge in the Thames. Finally, Virgin Media made use of a number of video formats to keep the campaign fresh. Having launched the hero asset, it went on to use cut-down versions featuring specific vignettes in relevant moments, like when Bolt won another gold medal in Rio. All in all, a gold medal campaign. Did you know that if you go into cardiac arrest outside of hospital you have less than one in ten chance of surviving because so few people are CPR trained? We didn’t either. 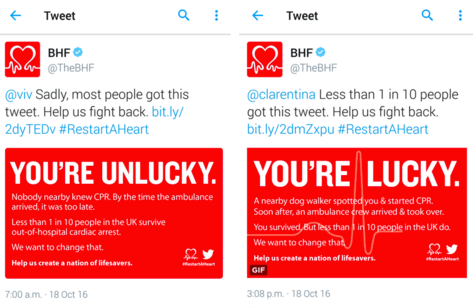 This year we worked directly with the BHF to call attention to this issue on #RestartAHeart day, in the first ever Twitter campaign powered by a heart. The campaign placed people in the shoes of those who go into cardiac arrest outside of hospital, and let them see what happens next. By tapping the heart in this Tweet a response was instantly triggered. One in ten people learned that they survived because someone nearby knew CPR and saved their life. For the remaining nine in ten, they learned that they were not lucky and were told they didn’t make it. The campaign generated a huge response with around 50,0000 uses of the hashtag, and with many people declaring publicly that they would get CPR trained. Watch the full campaign recap here. Marks & Spencer generated a huge amount of positivity this Christmas with its heartwarming campaign, #LoveMrsClaus. M&S launched Christmas on Twitter, in tandem with the big reveal during Channel 4’s Gogglebox, by simultaneously promoting the video and revealing its Twitter Custom emoji of Mrs. Claus herself. M&S built on the growing intrigue around Mrs. Claus by bringing her to life on Twitter the next day. Backed by a promoted trend, Mrs. Claus commented on the media storm, talked about how much fun she had opening Christmas on Channel 4, and shared the soundtrack from the ad. Meanwhile, a team of Mrs. Claus’ helpers replied back to all the love they were getting for the campaign through personalized GIFs and more.